SWE RMS Executive Council Slate Announced and Voting Now Open! The FY20 SWE RMS Executive Council Slate Has Been Announced! Voting is also now open, and will remain open until 11pm on Sunday, May 5th per section bylaws. Voting will be all electronic. If you encounter any issues with the voting form, please contact Andrea Johnson. 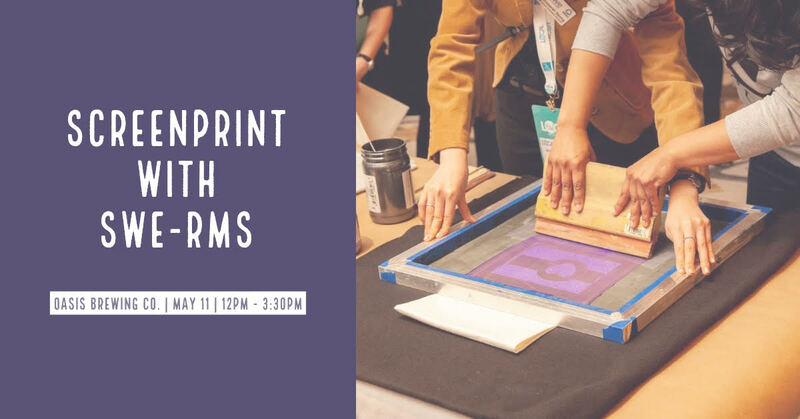 ​Spend an afternoon learning how to screenprint and enjoying craft beer at Oasis Brewing Company while supporting SWE-RMS! Everyone who attends can screenprint their own tote bag (provided) and an item of your own! Funds we raise go towards supporting SWE-RMS and our outreach efforts. Email Manisha (mghorai@gmail.com) with any questions! Recognize an outstanding SWE RMS Member! All SWE members and supporters are welcome to join this celebration of a great SWE year! Build new connections through a networking activity led by SWE Past President Jill Tietjen, be inspired by keynote speaker Ruthe Farmer of the National Center for Women & Information Technology (NCWIT), and help us recognize the finalists in the Great Women in Science and Engineering Essay Contest, recipients of SWE Rocky Mountain Section scholarships, and this year's recipients of the SWE Rocky Mountain Summit Awards. This year's SWE celebration is co-hosted by the SWE Rocky Mountain Section and the University of Denver SWE Section that is in the process of being chartered. Lunch will be provided. We look forward to seeing you there! Call for GESTEM Volunteer Guides!! SWE-RMS's free annual event for middle-school girls in and around Denver, designed to empower young women by introducing them to the vast possibilities of a career in STEM needs your help as a Volunteer Guide on Tuesday May 21, 2019 from 8 AM - 3 PM @ University of Colorado Auraria Campus in Denver. You will lead a group of ten 7th-grade students to fun, hands-on STEM-themed workshops and help provide them with exposure to the exciting world of STEM. You don’t need to be actively working in STEM, or a woman, just someone interested in helping girls learn how they can channel their ingenuity and creativity into these fields. Volunteers will be provided with a short pre-event training session via webinar, and helpful tips to help you make the most out of your day with the students. The day of the event you will receive a free box lunch including a sandwich (vegetarian option), fruit, cookie, and drink, and a thank-you gift! Register to be a guide here by May 9th: or visit the Society of Women Engineers (Rocky Mountain Section) GESTEM page to learn more. Check out our sponsorship page if you are interested in being a section sponsor and having your logo on our front page!